There are likely as many stocking traditions as there are families who stuff stockings. I remember commercials from my youth suggesting that a diamond tennis bracelet–because it did not break the size constraint–was a suitable stocking stuffer. (If that’s the case, make the stockings bigger–roughly the square, Fantasy Flight size game box.) In my family, “stocking stuffer” is a price range rather than a size limitation, and our stockings are often accompanied by bonus grocery sacks with things that are too big to fit in the stockings we have. But for today’s discussion of my recommendations for board game stocking stuffers, I’m offering two categories: one of small size, small cost games, and one of slightly larger games falling into a similar price range. Filler (stuffer?) games, if you will. There is perhaps no game in my collection with a better cost-per-play ratio. I purchased this game for $5 in 2006 and have played countless games of it since. While I don’t care for the Caliente variant included in the box, the base game itself is great. The game can be played with two standard decks of cards shuffled together, but the artwork, player aids, and design of the cards in this version (marking how many points each card is worth) make it worth paying a little extra for the special deck. This is for 2-4 people on the older end of kids. 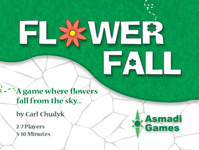 There are few games that are given over to such unbridled joy as FlowerFall. The game’s premise is slightly ridiculous: players drop cards onto the table to control the most valuable patches with their flowers. And in practice, the game is slightly ridiculous. But that’s also what makes it so fun. It’s fast, it’s simple, and because people are not generally good at dropping cards, there are big moments of catastrophe and rejoicing when something goes hilariously right or wrong. This works with 2-7 people, young or old, and is a blast to play. I reviewed this game yesterday just so that it could make it to the stocking stuffer list on time. 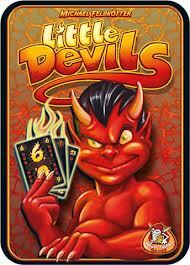 Little Devils is a very fun and novel trick-taking game similar to Hearts (you do not want tricks). There is some great tension in this game as no one wants to be the one to end up with the little devils. And because the tension is so high, I’ve not played this game in silence. It’s a great way to loosen people up. The game is better with more players, but is playable with 3-6. 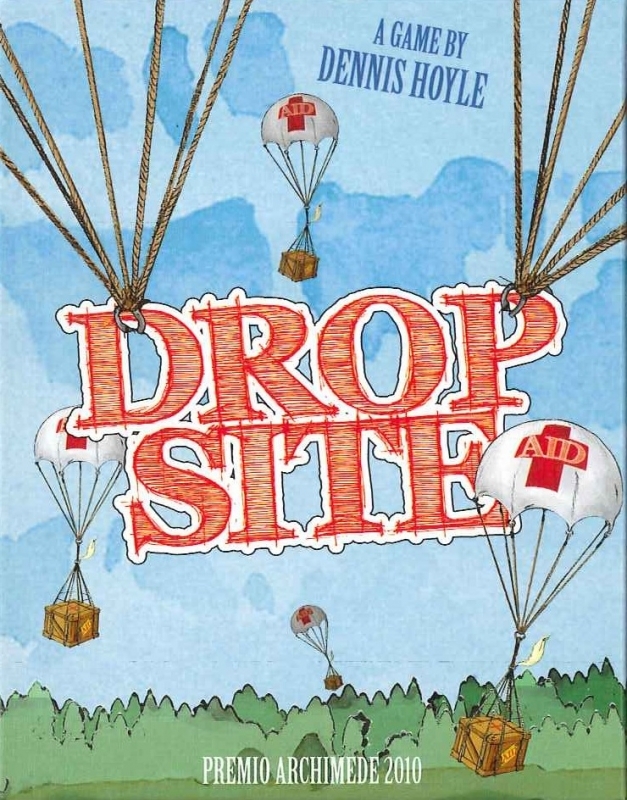 Drop Site is a clever, award-winning card game ostensibly about coordinating getting humanitarian aid to the people who need it. This theme isn’t important. What is important is that the game is good. 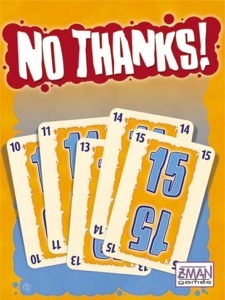 Drop Site involves a hearty dose of bluffing and moves as quickly or as slowly as the players want (but even when they want to move slowly, the game has a self-imposed timer mechanism). My wife loves this one, and I enjoy it quite a bit as well. It’s playable with 2-4 players and is only available from the publisher’s website. I haven’t gotten around to reviewing this one yet (I linked to Tom Vasel’s review above), but No Thanks! is a lot of fun. Each turn offers a binary choice: take the card in front of you (and all its chips) or place one of your chips on the card to pass. That’s it. The goal is to end the game with the fewest points, and chips are worth -1 point at the end of the game. No Thanks! is a fun game that involves good choices but within a very simple framework. It’s playable with 3-5, better toward the higher end of that number. This is a fantastic two-player-only game. A trading game with only two players shouldn’t work (Settlers of Catan, for example, requires three). But Jaipur works because the bank acts almost as a third player (but not in a fiddly, “Leonardo is the third player” kind of way). In Jaipur, everything is in perfect balance. Players can only do one thing per turn (buy or sell), and whatever you do will affect the other player directly, so you have to be careful when gauging the ramifications of any action. The game is also great because you really do feel like a haggler in a trading market trying to get the best selling prices while balancing this with getting the cheapest and best goods. Games go quick, and my wife and I love this game. Nile Deluxor was a surprise hit for me this year. It wasn’t on my radar, but after it arrived, I fell in love with it. 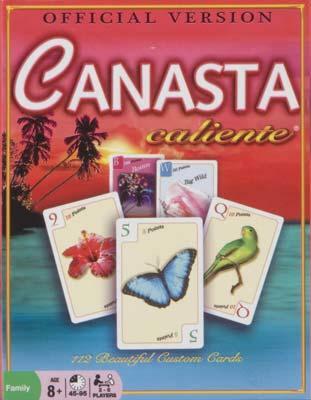 It’s probably one of my favorite quick pure card games. 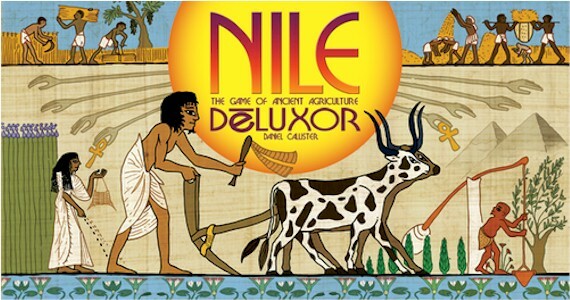 The game is about planting and harvesting crops by the fickle Nile, and it uses a scoring system similar to Tigris and Euphrates (whoever has the most points in their weakest category wins the game). But whereas Tigris and Euphrates is a hard game to teach (and the card game version of it doesn’t simplify concepts very much), Nile Deluxor distills the fun of the score system into a fast-moving card game that is easy to explain and play. Beyond this, the art on the cards is fantastic and flavorful, and there’s an expansion right in the box. What’s not to love? 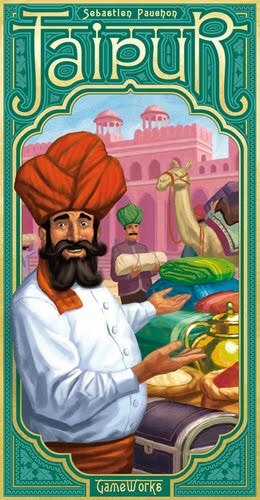 Ah, Bohnanza. My old friend. 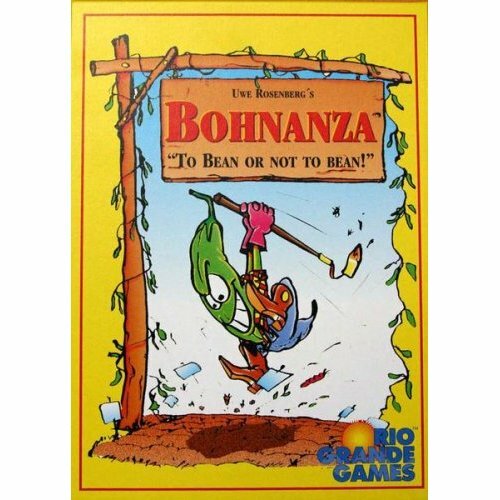 Bohnanza is a trading game for 3-7 players (the two-player variant is completely different) in which players must barter in order to plant and harvest the best fields of beans. They must barter because hand-order is fixed: beans must be planted in the order they’re drawn unless you can manage to trade (or donate) them away. There is always a lot of wheeling-and-dealing in this game, and my family loves it. Can’t get enough of it. I still enjoy it quite a bit too, mostly because it gets people talking quickly. And really, when else do you hear 3-7 grown people talking dead seriously about beans? It’s no secret that I love bidding games. A lot. In fact, if it weren’t blatantly disregarding stockings altogether, I’d probably tell you to buy Ra (at least, that’s probably what @Futurewolfie thinks). But since we’re talking about stockings (and I already chose For Sale as one of my main picks), I’m going to talk about Money. 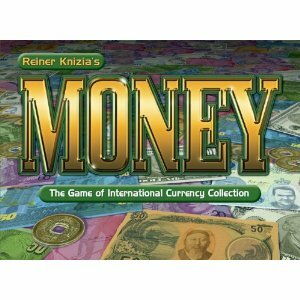 Money is a blind bidding and bluffing game from Reiner Knizia. The interesting thing here is that players bid with the very cards they are trying to collect, and all bids are secret. Games go super fast, and this is another one that my family goes crazy for. The scoring (in classic Knizia fashion) is a little wonky, but this is a Gryphon Bookshelf Series game: rest assured that it’s not too difficult. I brought this to Christmas two Christmases ago, and now there are three copies in the family. This game multiplies, and it’s good. 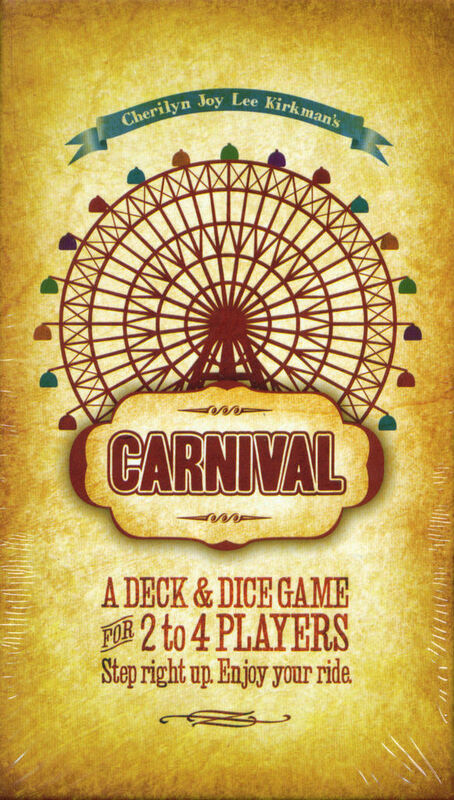 Carnival is an interesting deck-and-dice game. At its heart, it’s a very simple and straightforward rummy game: draw cards, play them in sets, discard cards for the win. But the dice really do add something special to this game. Basically, the dice limit the range of options that a player has on his turn. So you might draw a card from another player’s hand instead of the deck, or you might steal a card from someone else’s set for your own. There are enough ways to mitigate your luck that no one option leaves you feeling stuck. This game is a bit simple for my personal taste, but I think it would make a great gift for someone who is unfamiliar with or brand-new to hobby games. This game has mass-market written all over it, and that’s not a bad thing.